In recent Highway and Heavy Parts business polling, employee retention and managing cash flows were the top concerns listed by nationwide repair shops. Given the ongoing Diesel Mechanic shortage and the fact that business expenses seem to soar while income only inches along, it’s easy to see why. But, what if you could boost profitability and employee retention at the same time? Aside from cutting weekly paychecks, employee and financial management may seem like two separate worlds. However, as the market continues to push repair shops to their limits, the name of the game shifts to financial management and only the leanest repair shops will survive. 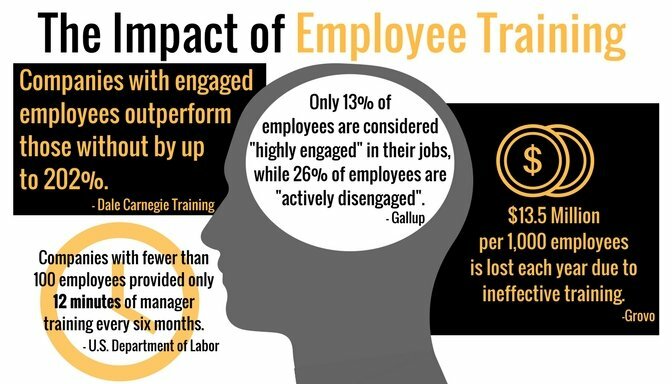 $13.5 million per 1,000 employees is lost each year due to ineffective training. Recent research by Grovo found $13.5 million per 1,000 employees is lost each year due to ineffective training. That’s $13,500 lost each year for each employee in a business; and for businesses that are trying to grow, or keep up with current expenses, that’s a huge loss. What’s more, Gallup recently reported that only 13% of employees are considered “highly engaged” in their jobs, while 26% of employees are “actively disengaged”. That means 61% of employees are somewhere in the middle, floating between being engaged and disengaged, which is a dangerous place to be for a business banking on their employees. Only 13% of employees are considered “highly engaged” in their jobs, while 26% of employees are “actively disengaged”. So what’s the answer? Simply put, it’s training. In order for a repair shop to exceed in today’s market, systemization and employee training needs to be at the top of the list of priorities. And, considering managers are only given 12 minutes of training every six months, it’s safe to say any emphasis on training is going to put your repair shop leagues above the rest (U.S. Bureau of Labor). Simply stated, training empowers employees; and empowered employees are loyal employees. According to Gallup, seven out of ten employees said job-related training and development opportunities directly influence their decision to stay with a company. And, considering the cost of replacing an employee ranges between 30% and 400% of the employee’s salary, it’s safe to say keeping turnover to a minimum is advantageous. 7 out of 10 employees said job-related training and development opportunities directly influence their decision to stay with a company. Not only does ongoing training actively correct patterns of mistakes, it makes employees feel valued and informed. It’s human nature to want to be a part of something, and most employees take the feeling of belonging to their place of employment personally. This is especially true for new technicians, as younger mechanics fresh out of training are drawn to training opportunities that allow them to own their career advancement. It’s easy to push employee training off in the interest of time. Afterall, today’s repair shop managers are largely overburdened; they can barely keep up with what they’ve got on their plate, let alone think about coaching and mentoring. A simple way to push training to the forefront of priority is to support and incentivize managers to train, and understand that by pushing one priority to the top of the list, a lower priority task may need to be reassigned. Support managers as they reprioritize, and motivate other employees to pick up additional tasks. Information moves faster than it ever has before, and with that comes an information expiration date. Commit a short amount of time each day, even if it’s 20 minutes, to staying up-to-date on the latest service bulletins, repair techniques, and product offerings. Commit to having five-minute stand-up meetings each day, where you review your findings with the entire shop team. Not only does this keep everyone on the same page in terms of information, but sharing information boosts morale and gives each team member a sense of belonging. One of the largest misconceptions surrounding training is that a manager or owner always has to lead the training. Placing a focus on, and committing to, employee training and information sharing will create a training culture within your repair shop. While you can’t change the culture of a business overnight, you’d be surprised how quickly you can enact drastic change. Start by systemizing your business, or building documentation of all the tasks within your business. This isn’t a small task either, but it can be done over time. One of the quickest ways to accomplish repair shop systemization is to segment the repair shop by function, and delegate a Systemization Champion over that function. For example, a repair shop could have a Financial Systemization Champion, a Parts Management Systemization Champion, etc. The goal is to document all functions to create a manual for the business. Once that’s created, you can hand it to any new team member and it’s instant training. Employee relationships can take repair shop training to a new level as well. Partner employees together, either by skill level, experience, etc. and employees will mentor each other. Not only does this provide instantaneous training in areas where employees need improvement, but it strengthens the bond of the team when everyone is expected to work and grow together. Training isn’t confined to the four walls of the repair shop either. Videos are an excellent training tool, and considering how much content is on the internet, it’s safe to say there’s a video pertaining to nearly every task of your business. Seminars and conferences are another excellent training tool. Reputable conferences include SEMA, Heavy Duty Aftermarket Week, and HDA Truck Pride, however there are a variety of conferences to attend depending on the focus of your business. Companies with engaged employees outperform those without by up to 202%. According to Dale Carnegie Training, companies with engaged employees outperform those without by up to 202%. From committing to a culture of training, to systemizing your repair shop, to using employee mentorships and training tools, training is the way to boost employee engagement and drive growth for your repair shop. Let us know how you’ve improved training in your repair shop by leaving a comment below, we’d love your feedback on the topic. Feel free to write to marketing@highwayandheavyparts.com with questions surrounding this blog, or suggestions for future Grow Your Business articles.